The Health & Education Fund—a partnership between CareOregon, Kaiser Permanente Northwest, Meyer Memorial Trust, Northwest Health Foundation and the Oregon Community Foundation—is pleased to award $1.2 million in grant funds in our inaugural Impact Partnership grant cycle to 21 organizations serving Oregon and Southwest Washington. We invited applications from organizations and projects focused on family leadership and resilience to improve outcomes in education, healthcare and early learning. Together we seek to support whole families and opportunity communities, focus on the strengths and assets these communities already possess, and promote enduring change through multi-year investments from the Health & Education Fund. Learn more about the Fund here. Funded through the Health & Education Fund Impact Partnership, these organizations will address barriers to health and education by building leadership and stronger relationships with parents and families, supporting parent and family organizing to change policy, and establishing partnerships with early learning, education and healthcare systems. Organizations that are currently developing parent-led efforts and community leadership and need time to establish and build relationships with early learning, education and healthcare systems received capacity building grants. Organizations that have identified a system change goal and are currently developing their existing efforts to support parent and community leadership to affect change at the intersection of early learning, education and healthcare systems received implementation grants. Latino Network's Culturally Specific Early Childhood project will engage more Latinx parents in policy advocacy work through their Juntos Aprendemos program by developing parent leadership groups focused on civic engagement skills and strategies. FACT Oregon will develop a Family Leadership Training Program and establish strategies to identify emerging family leaders with children experiencing disability across the state to equip and engage them to serve as systems change agents. The Confederated Tribes of Warm Springs will use funds to develop a P-3 Comprehensive Plan with an indigenous lens around prenatal to third grade initiatives for the Tribes. If you're interested in learning more about these amazing organizations and the work they are doing, please follow us on Twitter (@northwesthealth)! We'll be highlighting each of our new funded partners in the coming weeks. Chef Naoko describing the food at an NWHF board dinner at her restaurant Shizuku. We are proud of everything we have done at Northwest Health Foundation to ensure our grant dollars go to the communities who have the most opportunity to create positive change for everyone in Oregon and Southwest Washington. Over 75% of our grant dollars go to organizations led by people of color. Half of our grants go to organizations outside of the Portland metro area. And one out of ten go to disability communities. It has taken long-term, intentional work to reach these numbers. However, our budget is more than just grants. We spend quite a bit of money operating as an organization, hiring consultants to support our grantees, contracting with caterers and hotels, maintaining the Center for Philanthropy (our downtown Portland office space) and more. In 2012, when Nichole June Maher took over as Northwest Health Foundation's president and chief executive officer, she requested an audit of our operating dollars. She wanted to know what percentage of our operating budget was spent on hiring racial/ethnic minority, disability, LGBTQ and Oregon-owned firms. We were deeply dismayed to discover that only one half of one percent went to minority-owned firms, and 100% of our paid consultants were white. Eager to make a change, our leadership team and board immediately began to research philanthropic best practices around minority contracting. Unfortunately, at the time, they couldn't find a single example within our philanthropic network of an organization that had passed a policy to prioritize contractors from specific communities. A Healthy Beginnings+Healthy Communities gathering at Kah-Nee-Ta Resort in Warm Springs, Oregon. So we drafted our own policy centering minority, disability, LGBTQ and Oregon-owned companies, as well as companies that pay a living wage and provide quality health insurance and paid leave. We became members of the minority-led chambers of commerce in Portland and began to build our own list of vendors and caterers. We also set a goal. Given that Northwest Health Foundation existed for almost 20 years contracting with majority white-owned businesses, we decided we should spend at least the next 20 years with a focus on supporting racial/ethnic minority-owned businesses, with a secondary goal of supporting Oregon-based, LGBTQ- and women-owned businesses. Five years later, we have made significant progress. 95% of our consultants are people of color, and many are people of color with disabilities. Approximately 70% of our controllable business expenses go to minority-, LGBTQ- and disability-owned firms. (That's not counting women- and Oregon-owned firms.) This includes our plumber, our painters, our auditors, our lobbyist, Tribally-owned hotels across Oregon, amazing caterers and restaurants, photographers... We could go on. The most important lesson we have learned is it's not hard to meet these goals. There are plenty of incredible businesses out there owned and operated by people who reflect all of Oregon and Southwest Washington's communities and support our values. Now, we challenge you philanthropic organizations and nonprofits across our region. Adopt a similar policy. Leverage all of your resources. Join us in supporting Oregon and Southwest Washington's opportunity communities. You must have a long-term strategy and long-term commitment. Work at it every day. Every member of your team can be a leader in this work. While it is critical for your board and senior leadership to commit to this goal, it's the staff who really make it happen through their day-to-day decisions and the relationships they build. Use all of your influence. For example, anytime anyone calls to reserve one of our meeting rooms, we encourage them to use a minority-owned and -operated caterer. Don't think of this as charity. It's a good business practice. At NWHF, every aspect of our operations and customer services has improved with this shift. Northwest Health Foundation is excited to announce the Disability Justice Leaders Collaborative. The Disability Justice Leaders Collaborative will convene leaders from across our region to discuss how to ensure the voices and experiences of people with disabilities, particularly people of color with disabilities, are represented by decision-makers. They'll also discuss how disabled people can build collective power in Oregon and Southwest Washington. Over 100 people applied to be a part of the Collaborative, demonstrating the need for investment in this area. We invited 16 of them to meet four times over the course of the next six months. We sought leaders who expressed an interest in exploring and learning more about Disability Justice, who are already involved in efforts to build power in their communities, and who bring lived experience around intersectional identities and want to be part of a larger conversation about intersectionality. All the Collaborative participants identify as disabled people of color, representing Asian-Pacific Islander, Black, Latino, Muslim and Native communities. Our participants also identify in other ways, including queer, transgendered, gender non-conforming, youth, houseless, multi-racial, immigrant, refugee and rural. The work of this Collaborative will center around Disability Justice, a movement-building liberatory framework created in 2005 by Sins Invalid. Disability Justice centers Black and brown, majority queer disabled people to address the whiteness and single-issue focus of the mainstream disability rights movement. Disability Justice acknowledges that ableism works hand-in-hand with other forms of oppression and stresses that multiply marginalized disabled people get to create movements and organize out of their strengths, vulnerabilities, body/minds and genius. We’ve engaged two established Disability Justice movement leaders, Stacey Milbern and Leah Lakshmi Piepzna-Samarasinha, to facilitate the Disability Justice Leaders Collaborative. Over the long-term, we hope this effort will influence organizations led by people of color to learn about the Disability Justice framework and apply it to their work. We also hope these leaders will contribute to ensuring our region’s leadership includes disabled people and people who understand, and are committed to, Disability Justice. This Collaborative is a joint effort supported by Northwest Health Foundation and the Collins Foundation. We are eager to learn from these leaders and share our experiences with other funders and community leaders. Read more about Northwest Health Foundation's journey to understand and incorporate a disability equity lens in our work on Medium. Stay tuned for updates over the next few months! Everyone deserves the chance to lead a healthy life. That includes affordable healthcare, and that's why we’re proud to join over 60 groups in endorsing Measure 101. Mothers with access to affordable healthcare have healthier babies. Students with health insurance miss fewer days of school. Employees with access to affordable healthcare for themselves and their families are more productive and happier. All Oregonians benefit when friends, family, coworkers and neighbors can see a doctor or nurse, and don't have to visit the ER for routine care. Voting yes means that, for the first time, every child in Oregon will have healthcare. 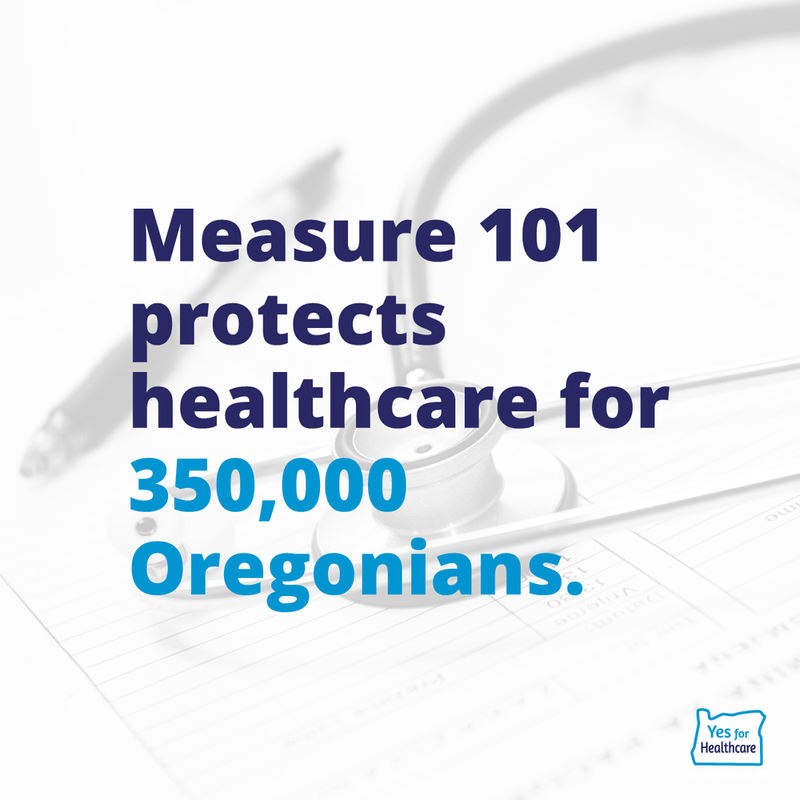 350,000 Oregonians rely on the funding that Measure 101 secures in order to keep their healthcare. I hope you’ll join us in voting YES on Measure 101 for healthcare this January. If you agree that every Oregonian deserves healthcare, no matter who they are or where they work, pledge to vote YES. The Kaiser Permanente Community Fund (KPCF) at Northwest Health Foundation is pleased to award $1.9 million in grant funds to 10 organizations improving health in Oregon and Southwest Washington. Awarded annually since 2004, these grants address health where it begins, in our schools, neighborhoods and workplaces – long before we ever see a doctor. At Northwest Health Foundation, we believe everyone should have the opportunity to lead a vibrant, healthy and fulfilling life. The best way to make that vision reality is by investing in communities. People know what holds their communities back, and they have good ideas about how to remove the barriers they face. Our job is to support communities to harness the talents and act on their ideas. If you're interested in learning more about these amazing organizations and the work they are doing, please follow us on Twitter! We'll be highlighting each of our new funded partners in the coming weeks. We're chronicling our journey to understand and incorporate a disability equity lens in our work. Our Learning Together & Connecting Communities cohort Getting to know one another at our first Gathering. Our Learning Together & Connecting Communities initiative is all about learning from one another and building relationships. So, on November 9th and 10th we hosted our first gathering with our Learning Together partners in Welches, Oregon. This included staff, clients and board members from nine organizations: Immigrant and Refugee Community Organization (IRCO), National Alliance on Mental Illness (NAMI Oregon), Autism Empowerment, Umpqua Valley disAbilities Network (UVdN), David’s Harp, Native American Youth and Family Center (NAYA), Disability Art and Culture Project (DACP), OPAL Environmental Justice Oregon and ourselves, Northwest Health Foundation (NWHF). For Northwest Health Foundation, the greatest benefit of this gathering was the opportunity to learn how we can include everyone, regardless of ability, in future conversations and events. As it turns out it, it isn’t as difficult as it seems. The key to inclusiveness is to ask, in as many ways as possible, as often as possible, what people need to participate. Ask as soon as a relationship is established. Ask a couple of months prior to a conversation or event. Ask again in the weeks leading up to an event. Ask at events. And ask post-conversation/event. For this particular gathering, NWHF started working with participants to make accommodations for physical and mental Disabilities in September. Prior to the event, we secured ADA compliant rooms at The Resort at the Mountain. We hired ASL interpreters. We worked extra breaks into the agenda for those who needed sensory breaks, and we planned a variety of activities (one-on-one, small group and large group, as well as visual, verbal, written, and kinetic) for people with diverse learning styles. At the event, we went around the room and asked each participant, whether or not they identified as Disabled, to voice how the rest of the group could help them feel included. One participant requested that we show appreciation with silent applause. Many participants asked that we leave pauses in the conversation so that everyone could have the chance to join in without having to talk over one another. Another participant said that dancing helped him participate. We managed to incorporate all of these requests with little extra effort. Now that the event is over, our next step is to send a follow-up survey to our gathering participants. We will ask them whether they felt included or excluded at the gathering and why, and we will use the answers we receive to improve future events and conversations. Organizations should be in the habit of asking these questions of everyone, because everyone should be able to participate in every event and conversation regardless of ability. Even people who do not identify as Disabled can benefit from this. Northwest Health Foundation cannot say that we are experts in this area—not even close. In the past we have not been the best example of these behaviors. However, with the help of our partners, we are learning, and we hope to share that learning with the rest of our Oregon and Southwest Washington community. In the meantime, check out this awesome music video made by one of our amazing Learning Together partners: Disability Art & Culture Project.